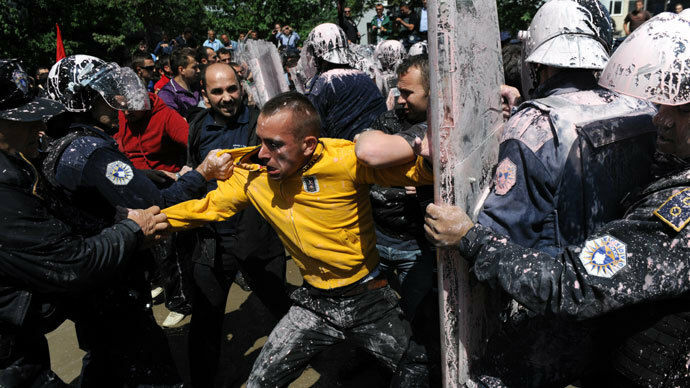 Hundreds of ethnic Albanians have been pepper sprayed and around 70 arrested amid clashes with riot police in Kosovo’s Pristina. 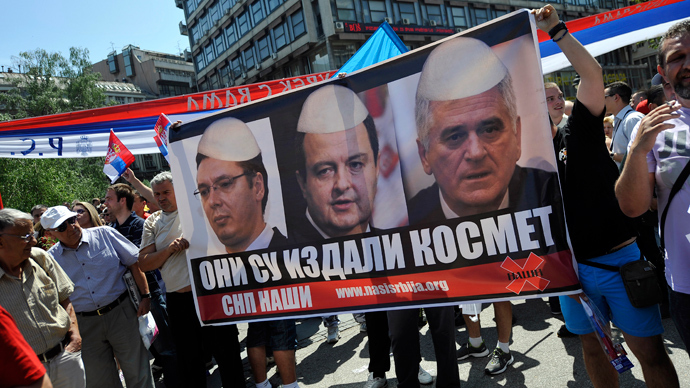 The violence came as Parliament approved an EU-brokered agreement aimed at normalizing ties with neighboring Serbia. Demonstrators aimed at preventing lawmakers from entering the Parliament building prior to voting threw cans of pink paint at police. Some 17 officers were wounded in a scuffle in front of the government and parliament buildings in the capital, according to local police. The protest has been called by Vetevendosje (Self-Determination), an opposition nationalist party which fiercely opposes the implementation of the 15-point pact which was signed in Brussels in mid-April. The party insists the pact will create an autonomous Serb region within Kosovo and would therefore undermine the young country's sovereignty. The movement also fears the deal will cement ethnic partition, which currently exists in Kosovo between the Albanian majority and about 50,000 Serbs who live in the northern town of Mitrovica. Serbia approved normalizing ties with the breakaway region on April 22. More than two months later, the deal has been passed by Kosovo’s 122-seat assembly with 84 votes in favor. Kosovo’s prime minister, Hashim Thaci, has admitted that achieving normal relations with Serbia will be difficult and complicated, but insisted he would pursue talks with Belgrade. "The independence road is irreversible and the process of normalizing relations between the two independent countries is unavoidable," he told legislators. On June 17, Serbia and Kosovo exchanged liaison officers – a step which should assist in the implementation of the EU-brokered deal. The agreement, which was reached during the EU-mediated negotiations between Serbian Prime Minister Ivica Dacic and his Kosovo counterpart Hashim Thaci, calls for the merger of the four Serb municipalities in the north - North Mitrovica, Zvecan, Zubin Potok and Leposavic. The urban district would have power over economic development, education, healthcare and town planning. Under the deal, Serbs in northern Kosovo will have their own police and appeals court. 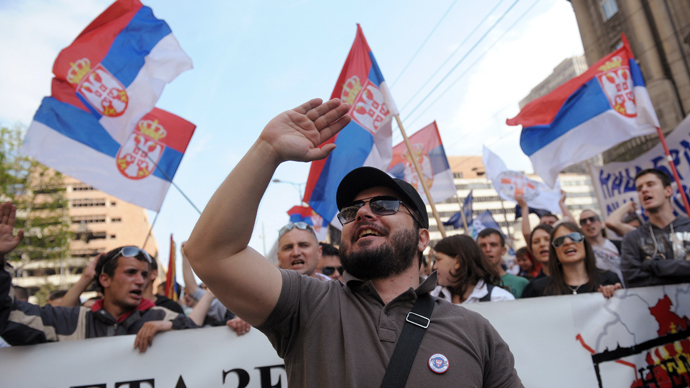 The agreement is widely regarded as a step toward Serbia’s entry into the European Union. Both Belgrade and Pristina have agreed not to block each other's efforts to seek EU membership. So far, Kosovo has been Serbia’s main obstacle to joining the bloc. Kosovo declared independence in 2008 and is now officially recognized by 100 nations - including the United States and 22 of the EU's 27 members. On June 28, EU leaders are expected to formally approve the start of EU membership talks with Serbia.